To access this page, click Customers > Channel Customers > Manage Channel Invoices. Find channel invoices for a specific company. 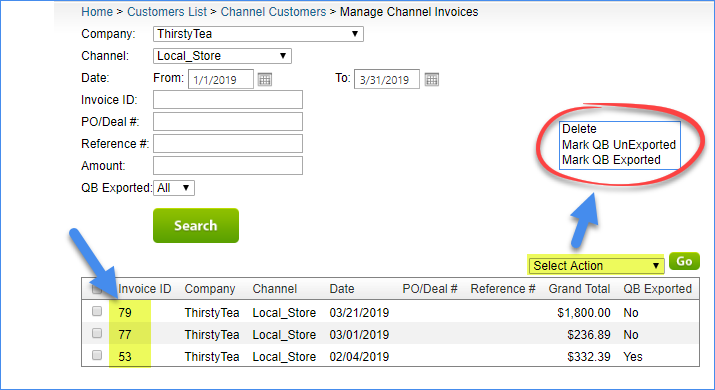 Find channel invoices for a specific channel customer. Only channels that are enabled for the selected company will appear in this list; however, Local Store and Wholesale always appear for any selected company because you can have orders for those channels without enabling them in SellerCloud. Find channel invoices within a range of orders' ship dates. Find a single channel invoice by its ID (the auto-created number for the channel invoice). Find a single channel invoice by its PO or Deal number. Find a single channel invoice by the number used to cross-reference it with your own internal invoicing system. Find channel invoices by their grand total. Find channel invoices by their exported status to QuickBooks (All, Yes, No). *Only shown if Enable QuickBooks Workflow is selected in the Client Settings. Auto-created number for the channel invoice. Company associated with the channel invoice. Channel associated with the channel invoice. PO or Deal number associated with a channel invoice. The optional number used to cross-reference the channel invoice with your own internal invoicing system. The status of the channel invoice's export to QuickBooks (Yes/No).